Have you ever wanted to look like Arnold Schwarzenegger in the movie Terminator? Now it's possible thanks to ColourVue Glow Red contact lenses! They shine with bright red colour under UV light giving and amazing effect that can be used during Halloween parties or other horror or sci-fi themed events. 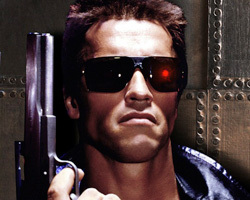 Buy now these crazy Terminator lenses and rule your costume parties!